TecRMI, TecAlliance’s information system for repairs and servicing information, now contains technical information on approximately 235 million of the 250 million vehicles registered in Europe. Covering models for all years of construction, this gives TecRMI coverage of over 94%. To best facilitate the implementation of TecRMI Solutions internationally, the information is now available in Chinese, Finnish and Swedish in addition to the 19 existing languages. The TecRMI database’s percentage of coverage for European vehicles, subdivided according to vehicle age. For 4–15 year-old vehicles, which are of particular importance for independent garages, TecRMI has OE-compliant information on servicing and repairs for 98 per cent of European vehicles. For vehicles older than 15 years, setting and repair data is needed, and this is supplied by the TecRMI module TecADJUST. 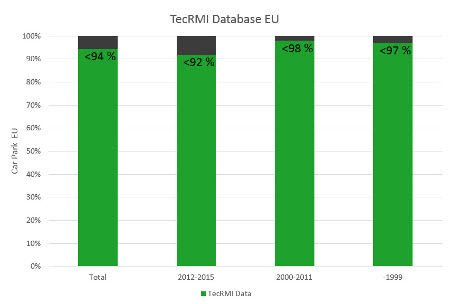 TecRMI covers more than 97% of vehicles in Europe in this age group too. In the fleet and leasing sector, the most relevant vehicles are between 0 and 3 years of age, and the TecRMI database covers approx. 92 per cent of these. With TecCOO, TecRMI offers this sector a tailor-made solution that can compare and calculate vehicle costs for servicing, wear and tear as well as wheels and tyres.